This all-day seminar, open to the Cornell community, will feature lectures by Erica Bosio and Valentina Saltane of the World Bank's Doing Business team, a book talk by Patrick Kabanda, author of The Creative Wealth of Nations (Cambridge University Press, 2018), and presentations by Professor Kaushik Basu (economics) and seven graduate students in economics and law. 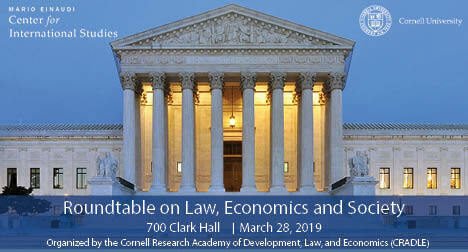 This event is organized by the Einaudi Center and its working group CRADLE, the Cornell Research Academy of Development, Law, and Economics, which connects faculty and students at Cornell with leading thinkers in academia, government, international development, civil society, and the private sector. Kaushik Basu is professor of economics and the Carl Marks Professor of International Studies at Cornell University. From 2012 to 2016 he was senior vice president and chief economist of the World Bank. Prior to that he served as the chief economic adviser to the government of India in the Ministry of Finance. He is currently president of the International Economic Association. He has held visiting positions at Princeton, the London School of Economics, Harvard, and MIT. A fellow of the Econometric Society, Basu has published widely in the areas of development economics, industrial organization, game theory, and welfare economics. Erica Bosio joined the Doing Business team in January 2013. She currently leads the design of the Contracting with the Government indicator. Before that, Erica led the Enforcing Contracts indicator for 4 years. Prior to joining the World Bank Group, she practiced arbitration and litigation at the law firm Cleary Gottlieb Steen & Hamilton LLP in Milan. She holds a Master in International Legal Studies from the Georgetown University Law Center and a law degree from the University of Turin (Italy). Patrick Kabanda is a Juilliard-trained organist and a Fletcher-trained international affairs professional. His first book, The Creative Wealth of Nations, was published in May 2018 by Cambridge University Press. He has taught at Phillips Academy, consulted for the World Bank, and contributed to the World Development Report 2016. He was awarded the 2013 Presidential Award for Citizenship and Public Service from Tufts University, Massachusetts. Valentina Saltane joined the Doing Business team in 2011. Since becoming a Sr. Private Sector Development Specialist in November 2016, she has been a member of the team in charge of reviewing Doing Business data. Ms. Saltane has led the Resolving Insolvency, the Starting a Business and the Trading across Borders indicators. Before joining the World Bank Group in 2007, Ms. Saltane held the position of research analyst at LECG. She has also worked for the World Resources Institute as a program coordinator. Ms. Saltane holds a master of public administration from the Cornell Institute for Public Affairs (CIPA), Cornell University. Wheelchair accessible. Please contact us with questions or requests.